From whom did the Greeks adopt their alphabet? Which three types of government existed in ancient Greece before Athens developed a democracy? Under the Greek definition of "citizen," who qualified for citizenship? Which democracy in Ancient Greece chose a smaller group to govern on their behalf? 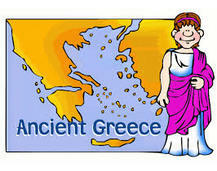 Which democracy in Ancient Greece allowed all the people (citizens) to decide government matters? Which type of democracy existed in Athens? Representative democracy can be found in the United Stated which makes laws and governs on behalf of their _____.